The responses to these rather simple questions have shown one thing; People either really like liverwurst or Braunschweiger ir they really, seriously dislike them. There doesn’t seem to be any in-between. Some people have unfortunately had horrible experiences in their childhood having to do with some seriously nasty products. These people obviously cannot be saved. There seems to be an overabundance of people who like various kinds of egg sandwiches though. I’ve often wondered how a Braunschweiger Omelet would go over. Maybe an Egg & Braunschweiger sandwich? I’ll have to work on that. This was a favorite sandwich of my grandmother’s. Her and I would eat the liverwurst with pickles and mustard on soft white bread. I haven’t had one in a long time and am not sure I could still eat it. Gee, I can remember taking these to middle school! In a bag, without an icepack. Back in the day. I just had an awesome liverwurst sandwich at McSorley’s Ale House in lower eastside NYC. General rounds of wurst, thin sliced onion and blazing hot mustard to add to taste. Along with a dark ale it was probably one of the best bites in the last 6 months. I love fried egg and liverwurst sandwiches. Fry liverwurst and put on a whole wheat hamburger bun. Top with a fried egg, fried until just set. A little mayo. Yummy. A good breakfast. Breads.Got to have a fine spear pickle with that ,too!.Now you have a World Class Sandwich!.David A.
I’m a chef at a very popular and busy restaurant in New Paltz, NY. This weekend I’m putting on the menu a very straightforward classic Braunschweiger liverwurst sandwich on marbled rye with Heidelberg Mustard and thin red onion rings. 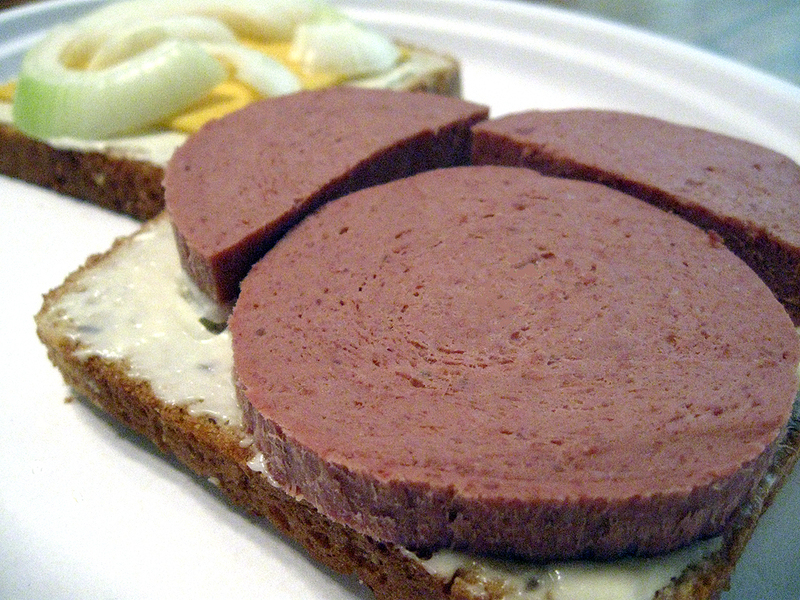 The liverwurst is from the Pennslvania Dutch country’s “Alpine Wurst and Meathouse”. Outstanding quality. I’ll post feedback after the weekend. One of my all-time favorite sandwiches! I make mine on soft white bread with homemade mayo, mustard, and a slice of american cheese. Fantastic! Braunschweiger is my FAV sandwich in the world! I just had one for dinner tonite. I also like it on rye bread, with Miracle Whip and onion slices, YUMMMY!!! My mom made them for me to take to school.It was always my fav. I even had one of my sons request one tonight when I was making mine. He seems quite pleased with it and he has never been nearly so adventurous with foods as I am. My grandmother and grandfather were from Germany. 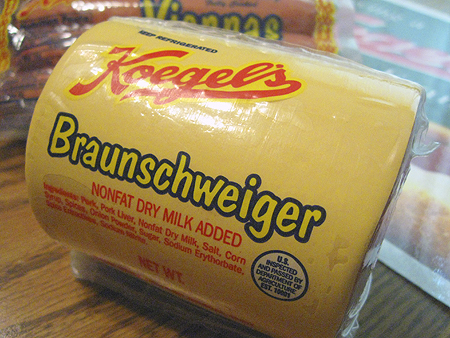 I have been eating braunschweiger sandwiches since I was a small child…The best ever. I put it on homemade pumpernickel rye, add mayo and mustard. Yum! As a child I would be given some change so that I could walk to the little store on the corner of our block and ask the owner to cut two slices of liver sausage for my lunch. A fine memory. Husband will talk about a favorite memory of his mother’s brauschweiger sandwiches along with potato soup. This weekend husband picked up pre-sliced braunschweiger and made us a favorite sandwich. Served on thin round bread slices, 2 slices of the liver sausage with mayo, dijon, swiss and sweet pickle slices. I love Braunschweiger. I distinctly remember my grandma serving it to me as a child with grape jelly. I have tried it recently with the jelly and am still really impressed with it. I would love to try making Braunschweiger grilled cheese too but am unsure which cheese would be best. I just finished my Braunschweiger sandwich. I prefer it on soft white bread but in a nod to some sort of health consciousness had it on whole grain. I love all the variations seen here. The one thing is, this sandwich brings back memories for all of us. My grandfather owned a delicatessen and made his won sausages and had the most delicious meats. I miss him. So happy to have found this discussion. Brought back great memories. I had a braunschweiger with a fried egg, swiss cheese and mayo on wheat toast this morning and it was amazing. One slice of any kind of rye. Spread with hot mustard. Top with 3/4″ Braunschweiger; 1/2″ layer of thinly sliced purple onion; and thin layer of sliced tomato. Top with thick slices of nutty Swiss cheese. Broil until cheese is toasted a light brown. Hey everybody, try braunschweiger sliced and FRIED!! On toast with mustard, maybe a little onion and a slice of swiss cheese. It’s amazingly good! This was the way my German grandmother served it – a bit gourmet for a humble lunch meat. My favorite way to eat braunschweiger is on wheat bread with a bit of miracle whip and some potato chips inside the sandwich for crunch factor. Ate this sandwich as a kid and nearly 50 years later it’s still my favorite. Jake, my mom and dad ate them with grape jelly. We also ate summer sausage and grape jelly sandwiches. i still enjoy both. i would like to know if this was a midwest/Wisconsin thing. My wife grew up with liverwurst and mayo.